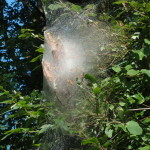 So many people have asked me about these unsightly silk tents at the branch tips of trees seemingly everywhere – yes, this seems to be a banner year for fall webworm. This caterpillar hatches in the summer from moths that lay masses of eggs on the undersides of foliage, and they can be found feeding on any of over 100 species of deciduous trees and shrubs.The larvae (caterpillars) feed on leaves (notice holes in leaves) and build silk tents. 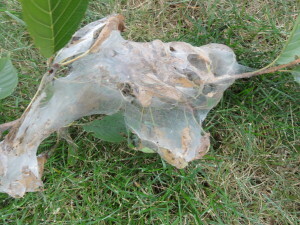 The leaves may ultimately appear skeletonized from the feeding, and the larvae incorporate leaves, and sometimes entire branches, into their silk spun tents. 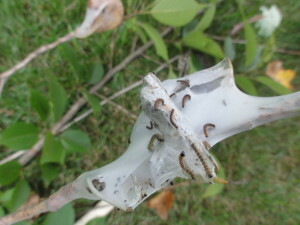 The tents appear to be full of debris, which comes from leaf parts, droppings, and cast skins.The tents are typically initially found at the branch tips. 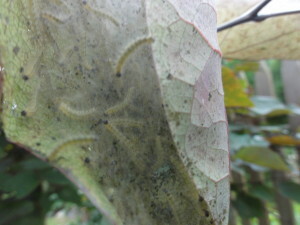 The caterpillars are varied in color, hairy, with paired dark spots along the back. The adults are small white moths. When fully mature, the larvae seek a protected location to pupate, and spend the winter in a cocoon in bark, building crevices, or debris on the soil. The adult moths begin emerging in late spring and then lay eggs. In this area, there may be a few generations through the summer. that will soon lose their leaves, the damage is mostly aesthetic, but bad infestations can defoliate trees. Since it is a native pest, predators such as various tiny wasps, often keep the population at bay. To encourage predators, make sure you have favorable host plants, such as those in the daisy family, in your landscape. If the damage is extensive or bothersome, the best action is simply to prune out the tents, destroy (crush) the caterpillars, and dispose of them in the trash (not recycling). As with many other caterpillar species, the bacterial insecticide Bacillus thuringiensis (Bt), can be effective when the larvae are still small, and is an organically acceptable approach, as long as you can break the nest open to spray the disease onto the pests. Additionally, as coated leaves are incorporated into the tents and eaten, the Bt will be ingested. 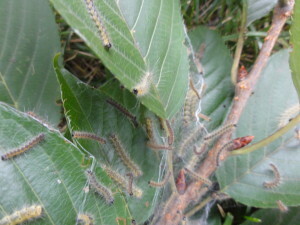 Photo on right of Kwanzan Cherry Tree shows more mature instars of the catepillar, which may not be impacted by insecticide. In sum, the fall webworm does not typically cause extensive damage to trees and shrubs, and since it is a native pest, it is susceptible to natural control by local pests. The defoliation that they cause is often late enough in the season not to be terribly detrimental. 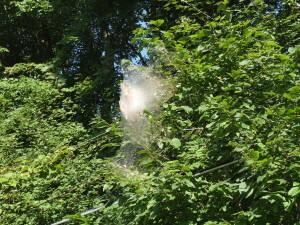 If you find the webs at a reachable area, then best to remove and destroy them to prevent their overwintering and causing more damage next year. Otherwise, let them be and, instead, look out for the many more destructive non-native pests that plague our landscapes.